WOW ! They did it, and $3,333 over the $11,000 goal ! 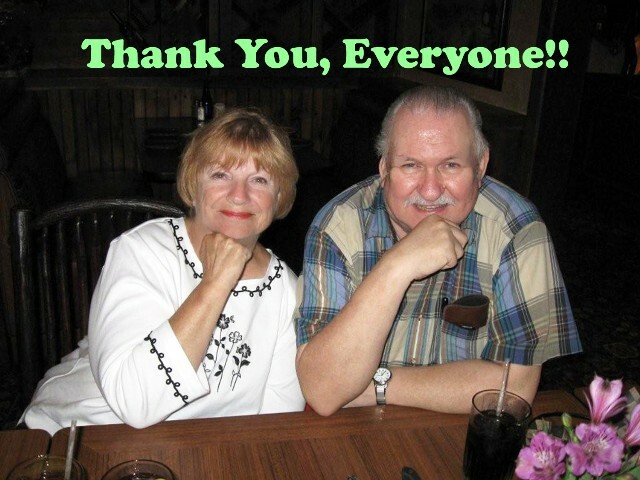 We here at Hollywood Gorilla Men would like to take a moment to thank all the friends and fans of Bob and Kathy for their support and generous donations that have made the Beast Wishes documentary possible. To Frank Dietz and Trish Geiger , a very special thank you for making this happen ! As Bob would say ; Two big Kong sized thumbs up ! I recently had the good fortune of becoming acquainted with illustrator Glen Mullaly at a local flea market when he stopped to thumb through my table of oddities. Glen's a very friendly and agreeable fellow whose style is reminiscent of classic children's books and 50's/60's magazine illustrations. 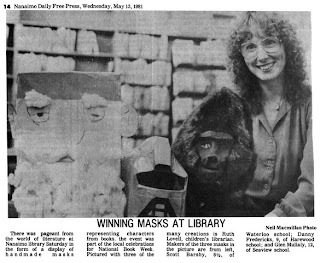 As if his terrific abilities with ink and lead were not enough to win my admiration, Mr. Mullaly sent me the photo and accompanying newspaper clipping below. 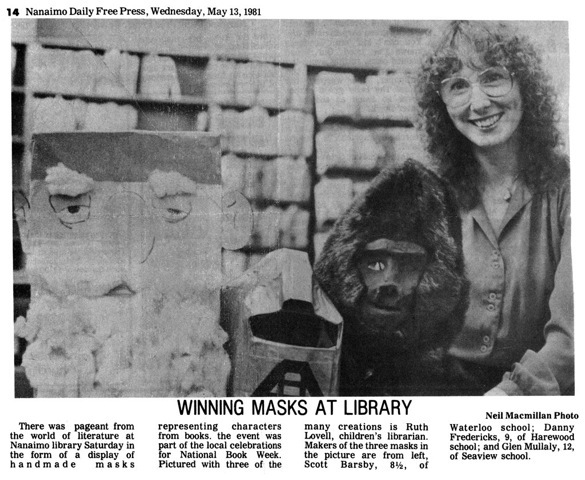 I have yet to pry his mask making secrets out of him but I am pretty damn impressed with his award winning Halloween creation from 1981 (that's his sis on the right). 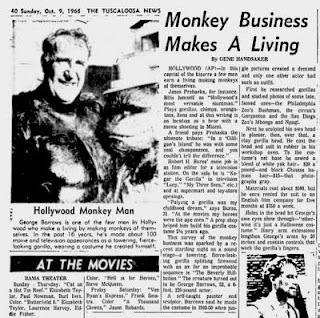 The recent post by Gorilla Man, about the comedic antics of Charlie Gemora, sparked my memory of one of my favorite Gemora funny bits. The OUR GANG short BEAR SHOOTERS was a favorite when I were but a wee little gorilla man. 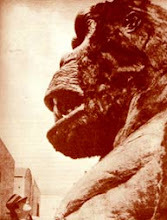 The way the gorilla hopped around after the kids burned a lasting memory in my childs brain. BEARS SHOOTERS also marked the first time I'd seen of a gorilla man being unmasked. In the short, Charlie plays one half of a criminal duo of robbers who have decided to hide out in the woods until the coast clears. 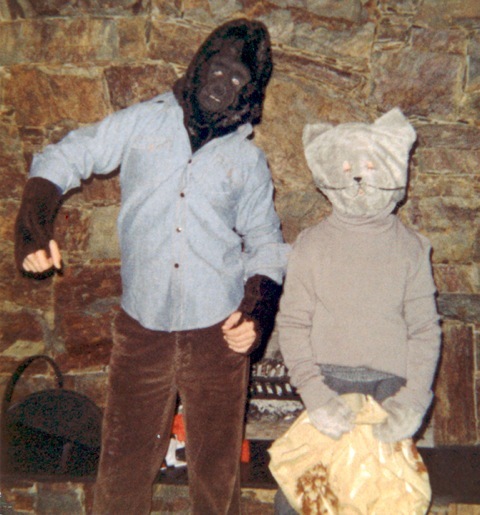 Charlie's character "Charlie" ( yes, they used his real name)has been delegated to wear a gorilla suit to scare off intruders. Needless to say, the Little Rascals have decided at that moment to go bear hunting in the same woods. Charlie is sent forth to scare off those pesky kids , but the fierce band of little hunters are not about to loose their quarry, much to the misfortune of poor Charlie ! After suffering the indignities of being kicked in his furry backside by a mule, falling hands first into a bear trap after having been tripped by a rope snare, he is shot repetedly in the keester with a pellet gun and arrows, then Charlie sits on a beehive the rascals have placed under him. 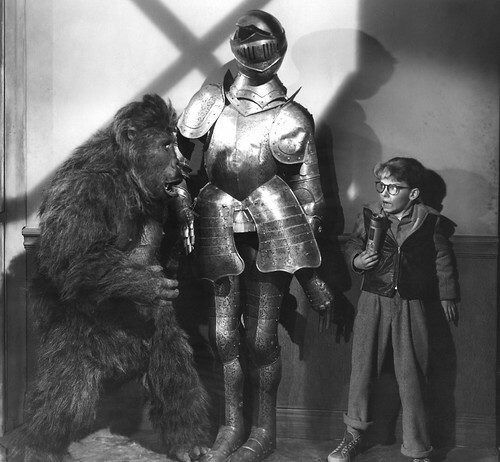 The panic striken primate then calls upon his criminal cohort to save him, but his rescuer is chased off by Petey the dog after the villain removes Charlies ape head. Charlie is hoplessly caught in the bear trap to be ravage by bees ! 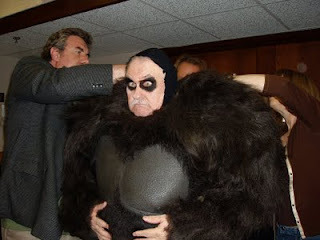 From that scene, I learned about the eye make-up that is a big part of being a gorilla man. As a small child, at first I thought the black around Charlies eyes was a mask, like old school villains would wear, but later I reasoned out the purpose. Charlie was the leader of the " Sweaty guys with racoon eyes " club ! Strippers and simians are like peanut butter and chocolate, tasty alone but a delectable treat when brought together. With the current Burlesque renaissance, the Beauty and Beast act has also enjoyed a revival across stages throughout North America and Europe. The dancer above is Pink Key Lee with her feel-copping cohort Gorilla X from the Hubba Hubba Revue - you can enjoy other images from this performance on her Flickr stream. 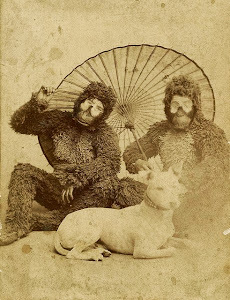 Most cinematic gorilla appearances fall into one of three categories: Horror, Adventure and Comedy. 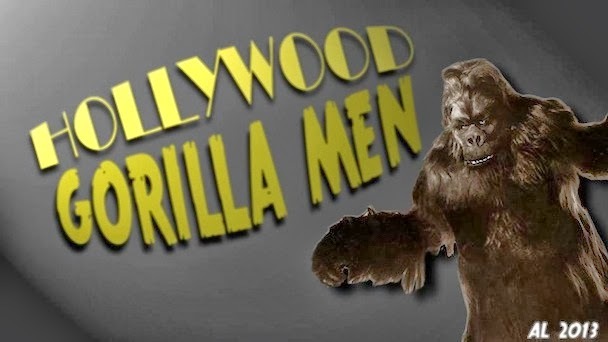 Charles Gemora certainly gives his alumni a good run at the title of World's Funniest Gorilla Man (though I would have to have photo finish to determine the winner with Barrows in the race - Addam's Family anyone!?). Charlie regularly appeared in funny flicks throughout his career and his talents at evoking a guffaw or two often shined in some pedestrian attempts at humor. With his mischievous nature, superb grip on body language and timing, and gorilla suits that emphasized naturalism, Gemora created a body of work that supercedes the dated nature of the material. Although WHO KILLED DOC ROBBIN? has lost much of it's sizzle (and is deplorably racist in a few scenes), this still is a cute reminder that Charlie could always make em' laugh. MORE on that last still with Gemora and fellow G-men, Art Miles and Emil Van Horn soon. 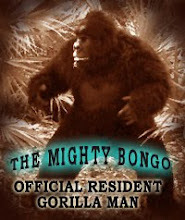 Our resident Gorilla Man, The Mighty Bongo has chatted with Bob Burns and confirmed the source as THE LOST TRIBE, an entry into the Weismuller Jungle Jim films. Bongo's investigations leave me even more puzzled - but more of that in detail as time permits.